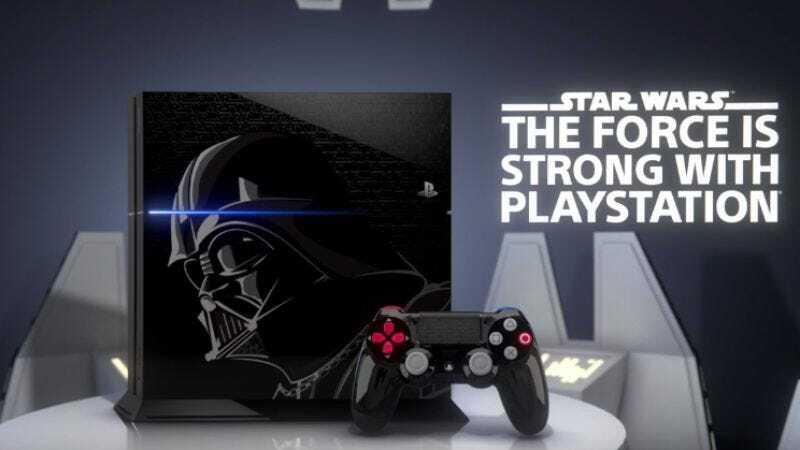 As reported by Game Informer, Sony has announced a fancy Darth Vader-branded PlayStation 4 console to tie in with the release of some big Star Wars video games that are coming out this fall. The console itself features a large image of Darth Vader’s face (or his mask, at least, because his face is hideous) along with the Star Wars logo repeated over and over again in case you forget the name of the thing that Darth Vader is from. Space Wars? Star Trek? Whatever, we’ll remember it eventually. The console—which has a 500 GB hard drive—also comes with an exclusive controller that’s designed to look like the buttons on Vader’s chest plate, so you can pretend you’re feeling up the galaxy’s most fearsome Sith Lord every time you’re playing Star Wars Battlefront. Speaking of Star Wars Battlefront, there are two ways to get your little, cybernetic hands on this handsome thing. The first way is in a bundle that comes with—you guessed it—Star Wars Battlefront, the upcoming shooter that lets you live out your dreams of dying as a nameless soldier in a pointless space war. The other way is exclusive to Wal-Mart, and it includes the more kid-friendly Disney Infinity 3.0, which offers you the privilege of paying real money to play as various Disney characters—including Marvel and Star Wars—in fun, sandbox-y worlds. This bundle also comes with Luke, Leia, and Boba Fett figures, as well as some other Disney Infinity tchotchkes that we don’t really understand. Both of these bundles will also include a voucher to download four “classic” Star Wars titles that will have “upgraded graphics” so they don’t look like melting garbage on your new PlayStation 4. The games are Super Star Wars (which was a Super Nintendo game, interestingly), Star Wars: Racer Revenge, Star Wars: Jedi Starfighter, and Star Wars: Bounty Hunter—at least one or two of which are actually pretty good. The console bundles will be available on November 17, and you can see a video showing them off below.